This model boasts changeable paper bags distinguished by the 10-quart capacity. 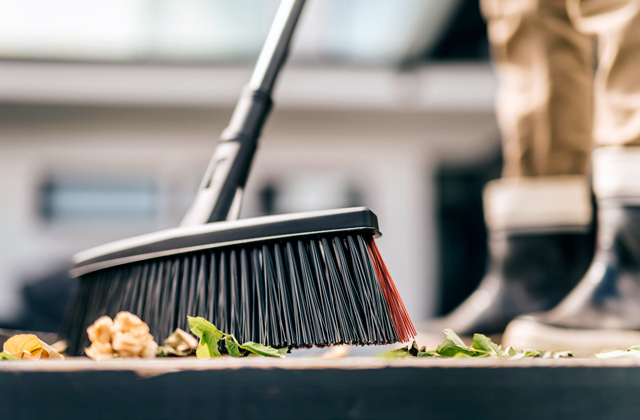 It means that you'll be able to clean really large premises without the need to stop and clean/change the bags very often. The ProTeam vacuum is what you need for day-to-day clean-ups of large commercial premises. 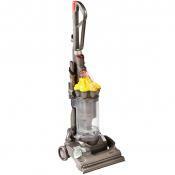 Fitted with a powerful motor, this vac can clean up to 7500 sq.ft. 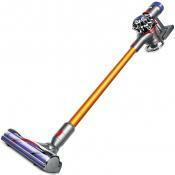 per hour effectively eliminating all kinds of debris and even ground in dirt. With that said, the ProTeam is times faster and more effective than standard all-purpose units. 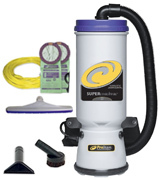 Five-level filtration system the vacuum comes complete with provides additional air cleaning from the finest dust particles and debris efficiently removing allergens, dander, and germs leaving the ambient air fresh and clean after every clean-up. A single HEPA filter is enough for several cleaning cycles. A relatively short flexible hose. 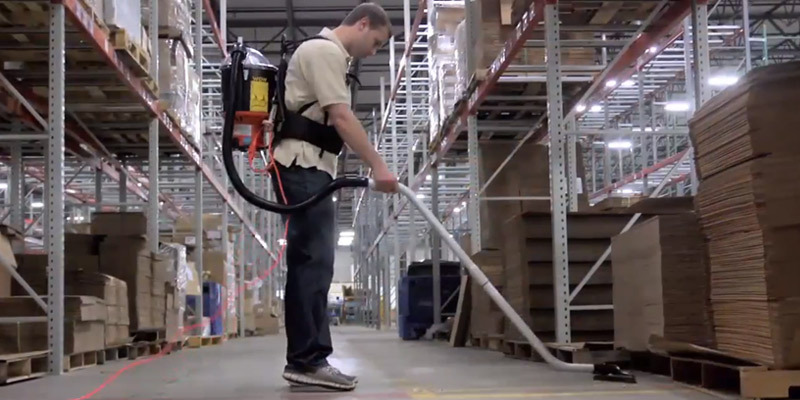 If ergonomics is at the top of your list, the Powr-Flite commercial backpack vacuum is what you really need. Striving to minimize the load on your spine and back, the manufacturer applied an innovative system of straps and belts with the VariQuick height adjuster allowing it to evenly distribute the weight over your back for maximum comfort. Thanks to the patented Hypercone™ Filter design, the suction power remains equally forceful, no matter if the HEPA filter is clean or requires replacement. Some users find onboard storage inconvenient. Affordable, practical, and functional, the Hoover Commercial backpack vacuum is compact enough to let you squeeze through the tightest areas and spaces. Pretty lightweight, it won't cause strain and fatigue on your back enabling you to easily clean various surfaces holding the wand with only one hand. It's a great choice for both large and smaller areas. The on/off button is placed on the hip belt so that you can effortlessly control the operation of the vacuum. An onboard storage for attachments greatly adds to the usability of the device. Changeable HEPA filters are quite expensive. The Sanitaire backpack vacuum is one of the quietest models which doesn't emanate loud noises that might irritate you or people around you, no matter what time of a day you operate it. With that, it boasts impressive suction performance and has proved to be effective on both hard and soft surfaces including high-profile carpets. The Atrix cleaner comes with an air-driven turbo-brush featuring an 11-inch cleaning path that removes hair and lint from low-pile carpets and carpet floorings much more effectively than standard carpet brushes. You might need an additional extension cord. With a great number of attachments that the Atrix vacuum package includes, you'll be able to carry out even a spring clean. 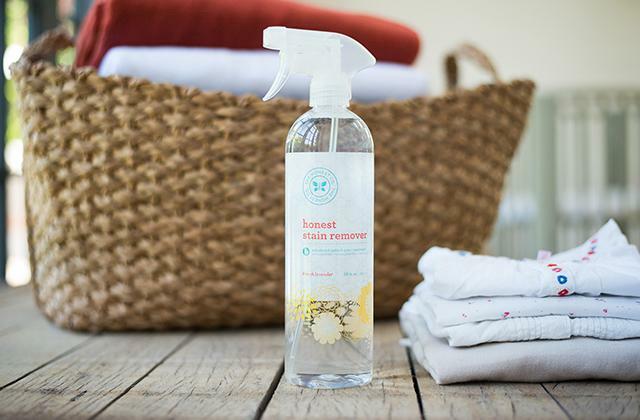 8 accessories for different cleaning purposes allow you to remove wastes, dust, and dirt from all types of floors as well as ceilings, moldings, window sills, furniture, and even computer and video equipment. 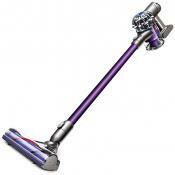 The ProTeam backpack vacuum is what you need to keep your business premises clean day after day. Being a powerful model with a 9.9-Amp motor, this appliance can handle low-pile carpet floors and solid stone or laminated floorings as well as soft furniture effortlessly. 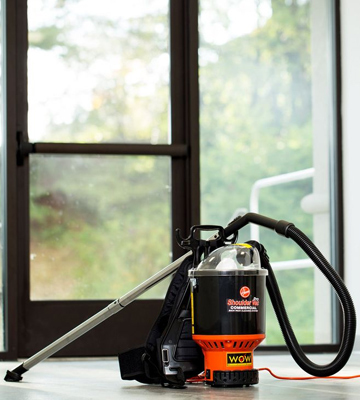 The first thing that makes this vacuum a perfect choice for commercial use is its corded type with a long 50-foot power cord allowing you to easily clean large rooms without the need to use an extension. 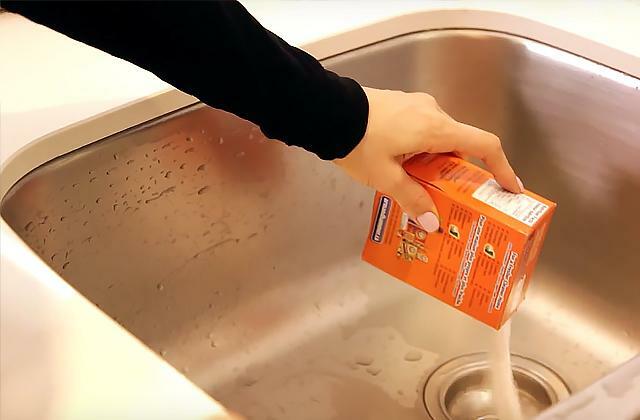 Two changeable 10-quart paper bags that come in the box are capacious enough to gather big amounts of dirt and dust without the need to be often discarded that will let you finish an all-around cleanup much quicker. 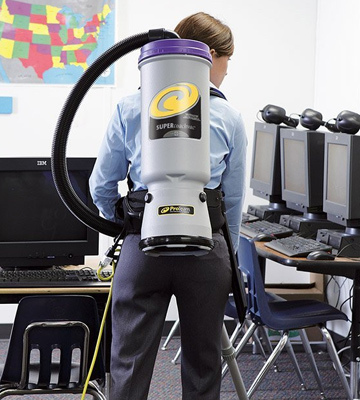 Moreover, the ProTeam backpack vacuum cleaner features four-level filtration system with a HEPA media filter that makes the air in your premises clean and healthy by killing up to 99.97% of allergens and bacteria. We’d also like you to pay attention to the attachments provided by the manufacturer since they contribute to the functionality of the ProTeam appliance. A soft dusting brush and an upholstery tool are what you need to keep furniture clean, while the Xover floor tool will handle dirt on any low-pile carpets and even wooden floors (make sure that you don’t use the appliance on delicate wooden covers to avoid unwanted damages). 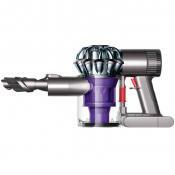 The crevice tool is an irreplaceable attachment to remove debris and dust flocks from corners and stairs. 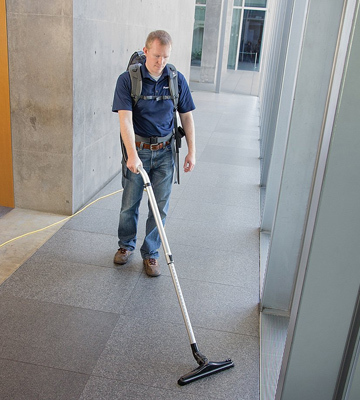 Take notice of the telescoping wand that can be adjusted for more convenient use or handling dirt in hard-to-reach places. Powerful and fully fledged, the ProTeam vac will help you clean commercial areas and create a favorable working environment in your offices or warehouses in almost no time. As it was already mentioned, backpack vacuums boast great ergonomic features, and the Super CoachVac from ProTeam isn’t an exception. 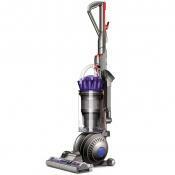 The ergonomics is determined by the type of the vacuum and some additional features. As for this vac, it has a system of adjustable straps to fit any user. A padded waist belt allows you to evenly distribute the weight of the vac on your hips, while adjustable shoulder straps make it suitable for people of any height and body shape. 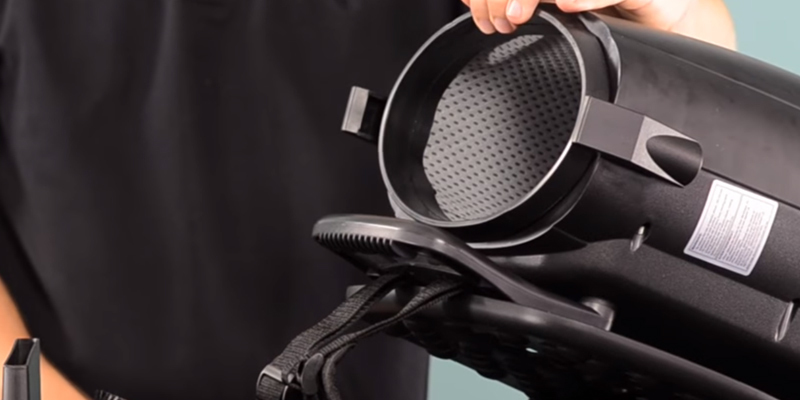 One more thing that makes the use of the ProTeam backpack vacuum not only convenient but also safe is a ventilated backplate that prevents the vac from overheating and the operator from sweating. Another usability feature we’d like to mention is the convenient location of the on/off switch placed on the waistband for the maximum convenient control of the appliance. 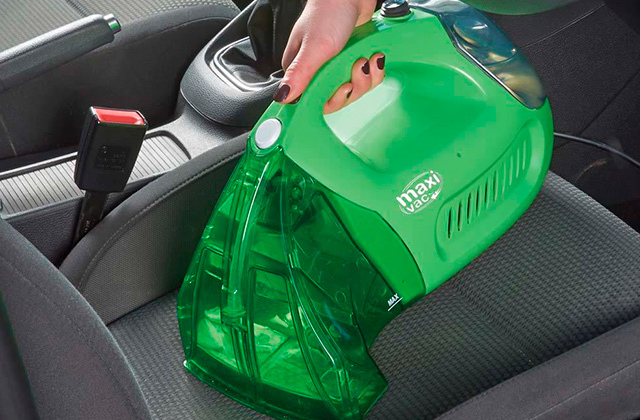 Finally, don’t overlook an onboard storage of this model that ensures that all the attachments you need for cleaning are within easy reach. If you want your commercial backpack vacuum not only to clean floors effectively but also to improve the air quality in your premises, this model from Powr-Flite will meet all your requirements in this concern. 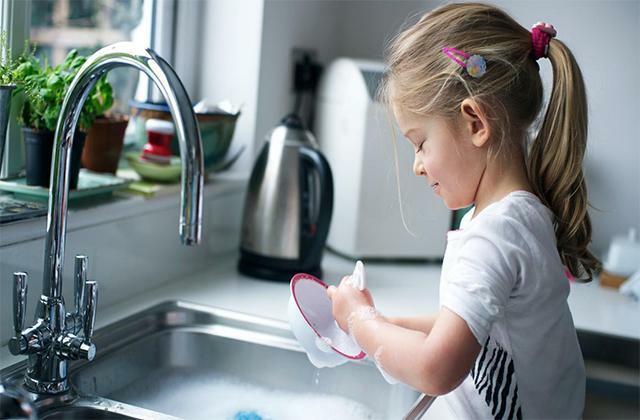 What makes this appliance a top choice for people who take care of the healthy environment is a five-stage filtration with a HEPA filter. The vac is equipped with a HEPA filter bag, micro-cloth intake filter, pre-motor filter, post-motor filter, and a washable exhaust filter altogether providing unrivaled air quality after every cleanup. By the way, the HEPA bags are changeable which means you’ll always get perfect cleaning results by simply replacing the old bag with a new one when necessary. Thus, the Powr-Flite appliance will be of great use in hospitals, beauty salons, and other places where a healthy environment is at the top of the list. 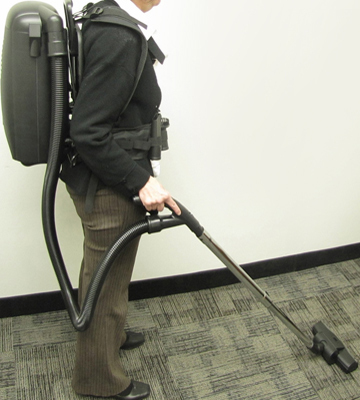 For even better cleaning results, the manufacturer has equipped this commercial backpack vacuum with a number of attachments to handle multiple cleaning tasks. Once you unpack the box, you’ll find a crevice, upholstery, dusting, Powr-Glide carpet, carpet, and hard floor tools that will allow you to remove dirt from any corner of your room or office without a hassle. For the operator's convenience, all attachments are kept on the waist belt to have everything you need for effective clean-up right at hand. Plus, it’s convenient to store the accessories together with the vacuum when not in use. Also, don’t overlook a crush-proof flexible hose and a double-bend wand that add to the functionality and usability of this backpack vacuum. A winning combo of a sophisticated filtration system and a complete set of helpful attachments make this model a good choice for public places and offices with large open spaces. Speaking of backpack vacuums, we not only expect them to be worn over the shoulders, we also want them to be convenient to put on and adjust. Moreover, it’s important that a backpack vac can be carried on the back for a long time without straining your back and shoulder too much. 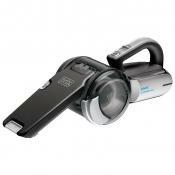 As for the Powr-Flite model, you can be sure you get an extremely convenient vacuum. The utmost appliance convenience comes from a fruitful cooperation of two companies - Powr-Flite and Deuter. Being an expert in hiking and backpacking industry, Deuter knows everything about how to take the strain off out of wearing heavy loads. Applying the technologies developed by Deuter, Powr-Flite fitted its vacuums with the Aircomfort waistband and shoulder strap system that reduces perspiration by 25%, while the Variquick adjustment system makes it easy to choose the necessary strap length to perfectly fit your body. 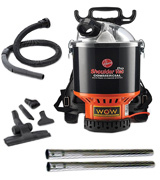 The Hoover Commercial backpack vacuum will become a great investment not only for cleaning companies but also for owners of mansions, small shops, cafes, and warehouses. 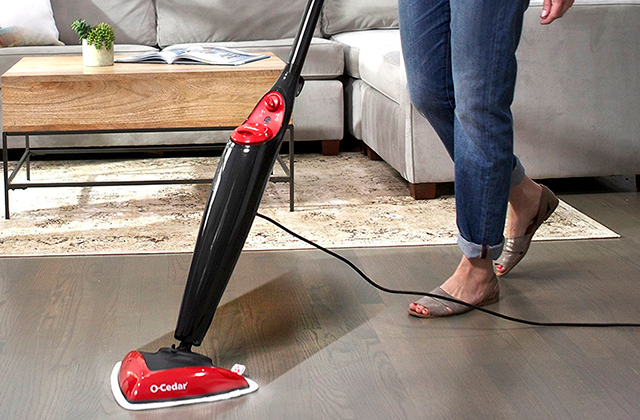 Equipped with an 8.5-Amp motor, this heavy-duty appliance "is ready" to work for hours non-stop, picking up dust on both carpeted and bare floors. Our consumers claim that the vac demonstrates great cleaning results on construction sites too, so, if you need a vac for cleaning worksites, you can safely consider the Hoover backpack vacuum option. 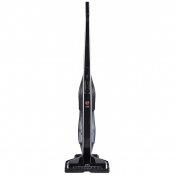 Among the features that make this vac an appropriate appliance for cleaning large areas is a long 48-foot cord that ensures effective continuous operation from a single power outlet in rather big premises. The cord can be replaced for a shorter one when needed, which is a handy option if you plan to vacuum some smaller areas. Thanks to a pretty capacious 6.5-quart dust cup, you won't need to empty it too often and you will always see when it's full due to a clear dome lid. 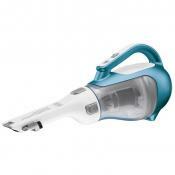 Besides, the hoover is compatible with disposable bags that are the best option for those who have any kind of respiratory problems. 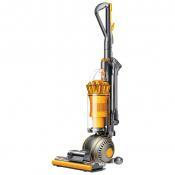 One more thing that makes the use of the Hoover backpack vacuum more pleasant is its silent operation. 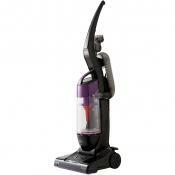 Of course, it isn't whisper-quiet as vacuums for home use but the level of noise it produces is safe and not annoying. Just like any electric appliance, the Hoover backpack vacuum can also cause accidents and injuries in case of improper use. That’s why it’s important to keep in mind some simple safety rules. The appliance is aimed at indoor use only, so, using it outdoors is prohibited. Also, avoid using it on wet surfaces to ensure its proper operation and prevent malfunctions. Don’t forget to unplug the vacuum after each use. It will reduce the risk of inflammation. Make sure you pull the plug not the cord when unplugging the vac. Don’t forget to turn all the controls off before unplugging the device. Refrain from using the appliance if the cord is somehow damaged. 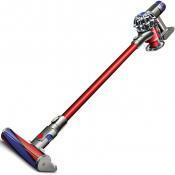 Don’t allow children or people with limited physical or mental abilities to use the vacuum without supervision. 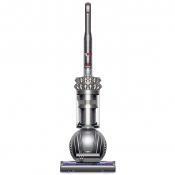 Use the Hoover vacuum with the Hoover attachments and accessories only. Using the appliance with tools, brushes, or dustbin bags from other manufacturers can lead to the appliance malfunction. Make sure the airflow isn’t blocked. Don’t let hair, loose clothing, and other objects prevent normal air circulation since it will impact the suction power. Remember these simple rules and let the Hoover backpack vacuum cleaner become your reliable assistant that will facilitate your cleaning chores to the maximum. 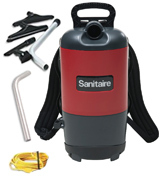 The Sanitaire backpack vacuum has all the features you expect from a good appliance of the type, and even more. 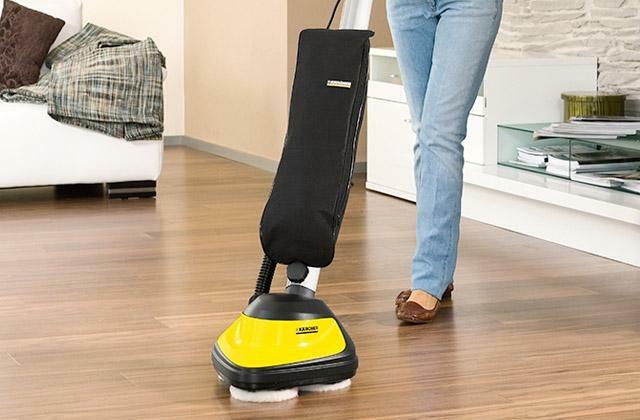 Although this vacuum isn’t the lightest model represented on the market, it has adjustable straps that ergonomically and conveniently fix the unit on your back, redistributing the load in a proper way. Plus, the appliance is equipped with a handle on the top for convenient handling when it’s not in use. 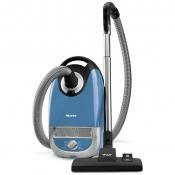 In addition to its usability, the Sanitaire backpack vacuum cleaner boasts the unsurpassed performance. 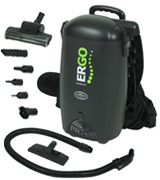 The appliance has an 11.5-Amp motor that delivers a powerful suction to remove even ground-in dirt and grime from low-pile carpets and bare floors in no time. And a great number of accessories that come in the box including a double-bend wand, curved aluminum wands, a dusting brush, crevice tool, carpet tool, and a bare floor tool, will help you tackle dust and debris in every corner of your premises with the maximum convenience. Moreover, all the tools will always be within easy reach, thanks to a handy onboard storage. Don’t overlook a long 50-foot cord of the appliance that will save you the need to use an extension cord when cleaning in large premises. 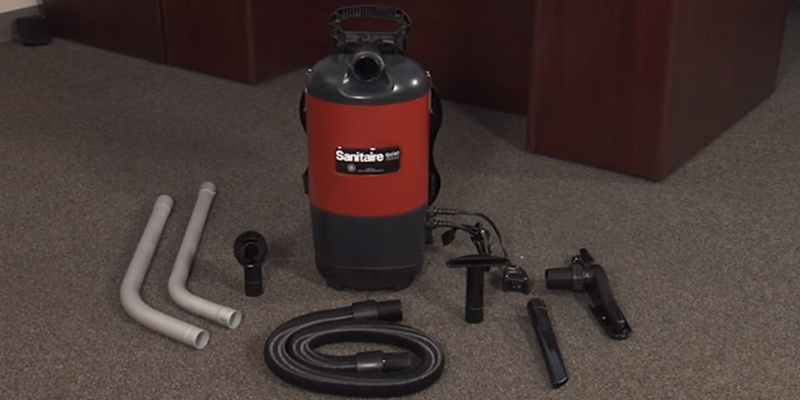 Another advantage to purchasing the Sanitaire vacuums is its hassle-free maintenance. Basically, all you will need to do after use is is remove dust bags. This model works with 6-quart paper bags and uses a HEPA filter for capturing more dust. Keep note, though, that in order to ensure flawless performance of the appliance, it's highly recommended to use only original Sanitaire filters. Easy to carry, convenient to use, powerful, and distinguished by high performance, the Sanitaire backpack vac will tackle all kinds of dust and debris on any type of surface making a perfect addition to any commercial arsenal of cleaning tools. 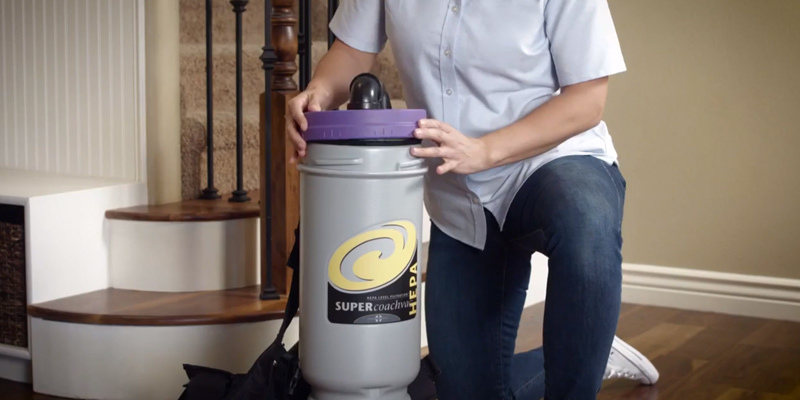 What we liked about the Sanitaire backpack vacuum is that it has a couple of certificates giving it a winning benefit over the models that don’t have such certificates. This appliance meets the requirements of the L.E.E.D. (Leadership in Energy and Environment Design) Program. 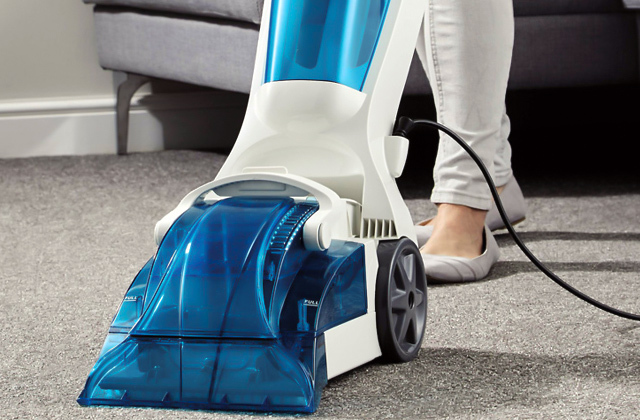 Being a member of this program, Sanitaire has produced a special line of Quiet Clean appliances that work under 70 dB, and this vacuum isn’t an exception. It is also CRI Green Label approved, which means its performance has been assessed as high, in particular, the Sanitaire vacuum was tested for dust containment, soil removal, and carpet appearance retention. All those certificates make sure that with the Sanitaire vacuum, you will get the functional and environment-friendly appliance to keep your workplace clean. 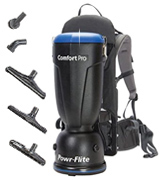 The appliance is equipped with a forceful 12-Amp motor that makes it one of the most powerful models among commercial backpack vacuums available on the modern market. All of this is thanks to a corded design ensuring continuous power supply. However, we want you to take notice of a short power cord the model is fitted with. 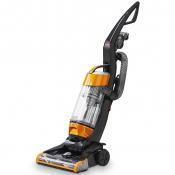 It measures only 2 feet so you’ll definitely need to use an extension cord with the Atrix vac. However, an impressive suction performance outweighs this minor drawback. 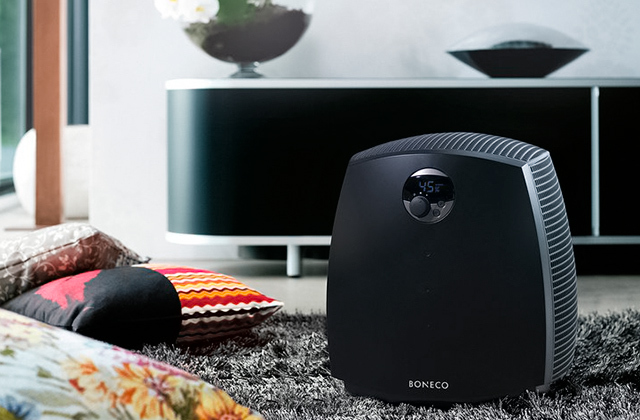 A four-level filtration system with a HEPA filter ensures clean air in every room you clean. The appliance works with capacious 8-quart dust bags that allow you to forget about the need to replace them for a long time. 6-foot flexible hose, an extension wand, 3 blower nozzles, a furniture nozzle, crevice tool, round brush, floor brush, and a special air-driven turbo brush are the things you'll find once you open the Atrix package. 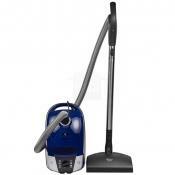 Ergonomic features of this vac are determined not only by adjustable straps and the light weight of the appliance but also by its overall design. This model has a rectangular shape that some consumers would find more convenient to use than a cylindrical one. Plus, the hose and wand positions can be easily adjusted for both left-handed and right-handed use. 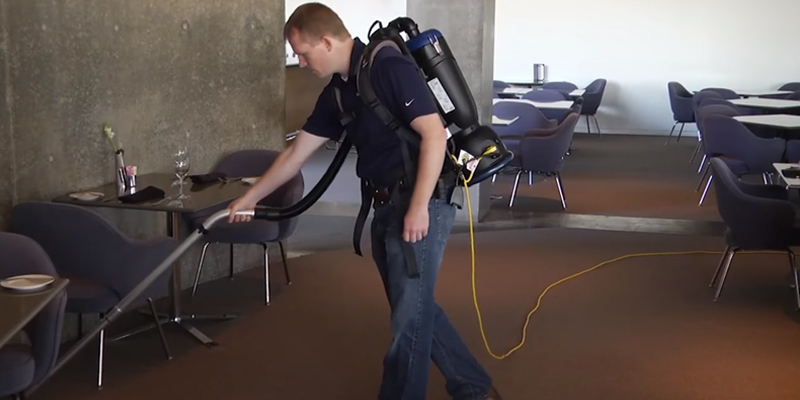 If you need power and versatility to complete a variety of cleaning tasks around some commercial or public areas, the Atrix vacuum is the right model to go for. Full dust bags prevent normal vacuum operation by reducing the suction power. Hence, it’s important to clean them on a regular basis. Moreover, all the bags are changeable so replacing them from time to time is also a sensible decision. Handle a power cord with care. Make sure that it doesn't tangle in the same places to avoid its quick wear and tear. Store an appliance in a dry place when it’s not in use. If the backpack vacuum housing needs cleaning, use a soft cloth to dust it off. In case of a malfunction, don’t try to repair the unit on your own. It's better to contact a certified service center in order not to do more damage. 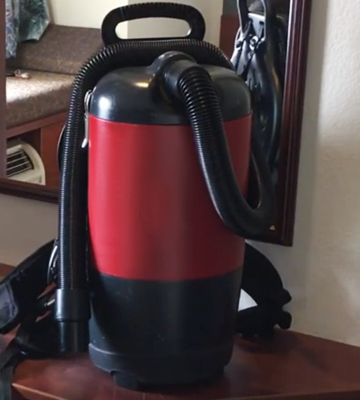 What Is a Backpack Vacuum? You have probably guessed what backpack vacuums are. As the name suggests, these are specifically designed vacuum cleaners that are worn over your back when in use, just like an ordinary backpack. 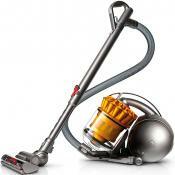 With such a great number of vacuum types represented on the market, why might you need this one? Well, these vacs are appliances originally meant for commercial use and will become a great purchase for cleaning companies to provide professional cleaning services as well as for entrepreneurs who need to keep their working premises clean and neat. Backpack vacuums have a number of features that make their use extremely convenient for commercial and industrial cleaning purposes. First of all, they boast better maneuverability than upright vacuums due to better ergonomics since you don't have to push or drag the unit itself. They ensure a more natural position of an operator that prevents vacs from tipping over or tangling in power cords. Thus, cleaning narrow hallways and hard-to-reach places like stairs, corners, and tricky crevices becomes the easiest thing ever. 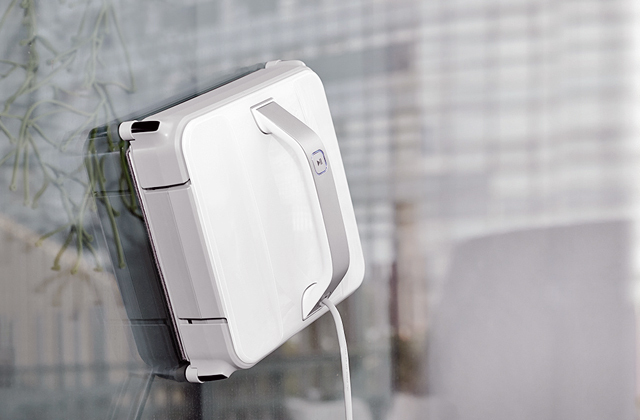 Secondly, backpack models have longer power cords than the ones for home use, so, you'll be able to clean larger premises without using an extension cord or constantly looking for a socket. Look through our backpack vacuum reviews and find out more about these appliances and choose the one to meet your commercial needs. Heavy-duty floor polishers are other devices for commercial use that can help you keep uncarpeted floors in a brand new condition. And if you are into modern technologies, you might be interested in robotic vacuums that will literally do all floor cleaning job for you. When it comes to choosing a backpack vacuum, one of the first things you want to pay your attention to is its performance that is determined by the unit type, motor power, and dustbin capacity. 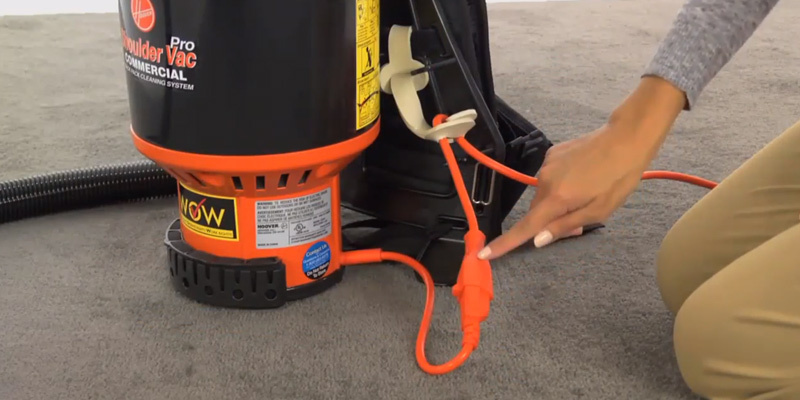 The majority of backpack vacuums are of the corded type which means they are connected to a constant power source so that you can spend as much time on floor cleaning as you need. Moreover, backpack models are usually equipped with long power cords to allow you to handle large premises with ease without using lengthy tangling extension cords. 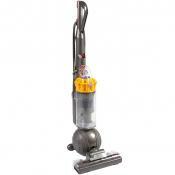 As it has been mentioned, backpack vacuums are mainly aimed for commercial use, so, they usually boast high motor power. Of course, it varies from model to model, but in general, the power of 10-12 Amps is enough to handle heavy-duty floor cleaning tasks. If you’re looking for a model for home use or small office, 8-9 Amps power will do for your needs. The dustbin capacity determines how long you can use your vacuum before changing the bin. The larger the capacity is, the less frequently you’ll need to replace paper bags in bins. Bin capacity of modern backpack vacs normally varies from 6 to 10 quarts. 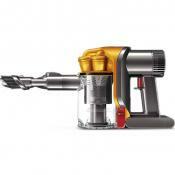 Attachments are worth your consideration too since they define the functionality of the vacuum you choose. There is no need to explain what the all-in-one, upholstery, crevice, hard floor, or carpet tool is meant for since everything is clear from their names. These are the main brushes and nozzles that come with backpack vacuums. Yet, if some tools you might need are not included in the pack, you can always buy them optionally. The only thing to remember when buying attachments additionally is that they should be from the same manufacturer to fit the vacuum and to ensure its proper operation. Convenience and weight are the things that determine the usability of a backpack vacuum you go for. Although the ergonomic design of these appliances makes its use close to effortless, you might still be interested in choosing the most lightweight vac depending on your personal preferences. 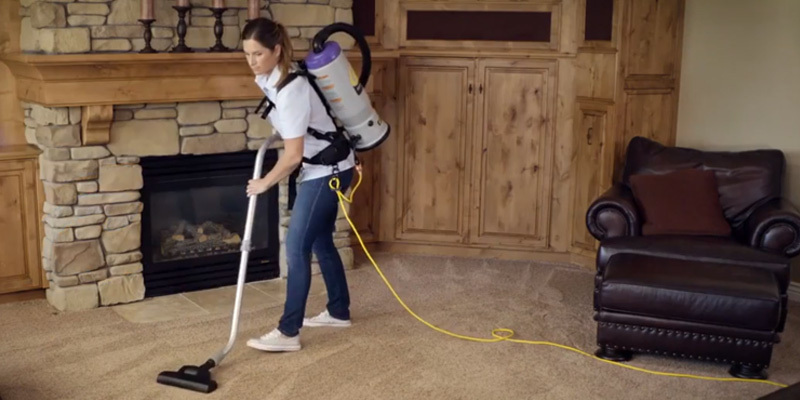 As for the convenience features, the manufacturers usually equip their models with adjustable straps to make the vacs suitable for users of different height or bodily structure. On-board storage is another usability feature that allows you to have all necessary tools right at hand. 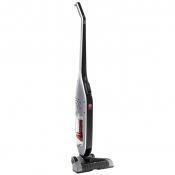 - Backpack vacuums ensure a more natural body position of the operator. They save you the trouble of bending all the time while vacuum cleaning your premises, thus, eliminating the risk of back strain and excessive fatigue that might lead to some more serious back problems. - As a rule, modern backpack vacs are equipped with onboard tool storage keeping all the necessary attachments for cleaning right at hand that is especially important for commercial cleanups of really large premises. Thanks to this very feature, cleaning with a backpack model is not only more convenient but also times faster than with an upright vacuum where you will have to get back to the closet to fetch the necessary attachment. 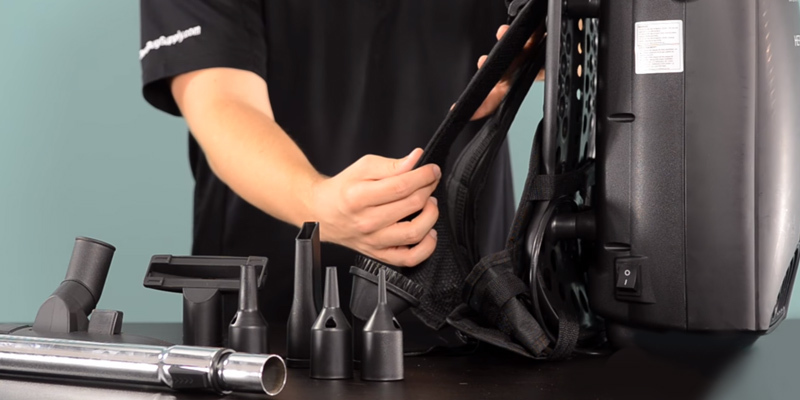 - Backpack vacuums come with 4-5 accessories for multiple cleaning tasks. Moreover, they usually have long flexible hoses and extension wands that allow you to clean hard-to-reach places like stairs, underneath furniture, or corners effortlessly. Of course, backpack vacuums also have their disadvantages and you want to be aware of them before choosing this very type of cleaner. 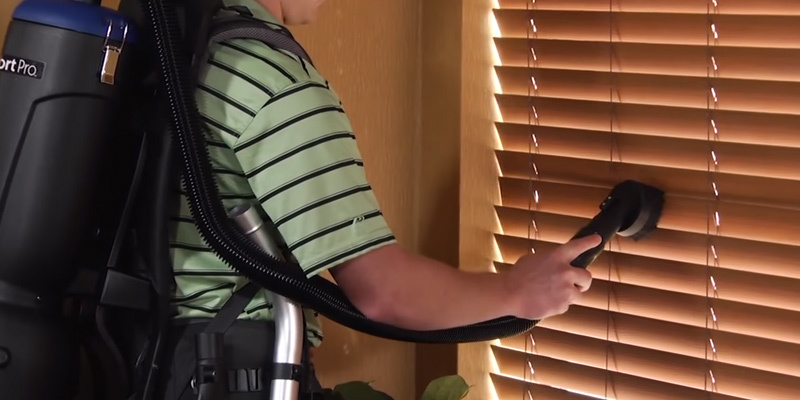 The name of a backpack vacuum implies that you will wear it on your back. Although the manufacturers of these appliances try to make them as ergonomic as possible, you can still sweat when wearing these vacs. So pay close attention to the materials the waist belt and straps are made of to ensure the maximum comfortable usage. Another drawback of these appliances is that they aren’t suitable for cleaning small rooms. 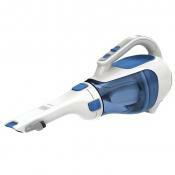 You simply won’t have enough space for cleaning closets or narrow halls conveniently. Now, when you know all the pros and cons of vacuum cleaners, it’s up to you to decide whether this appliance will meet your home and commercial cleaning needs. - There is a Museum of Vacuum Cleaners in St. James, Missouri. It is the first museum of a kind to be ever opened. The idea to open a museum of vacuum cleaners belongs to Tom Gasko. This man has been interested in vacuum cleaners, their designs, and operation principles from his teenage years. He started to collect various models of vacuums and had gathered the collection of more than 600 appliances by the late 2000s. Initially, the museum was aimed at teaching engineers at the factories specializing in the appliance production about the history of vacuum cleaners. Later on, local people also became interested in this museum, so it became public in 2009. You can visit the museum 6 days a week to learn more about professional vacs, models for home use and much more information about the appliances the whole cleaning philosophy of the 20th and 21st centuries is based on. 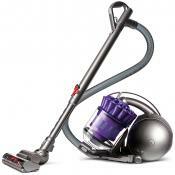 - Hoover is another word for a vacuum cleaner that became popular in the USA with the appearance of the Hoover company. 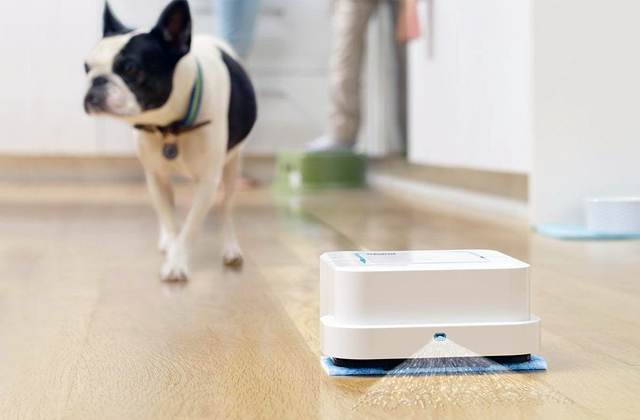 Its story began in 1907 when Murray Spangler invented a device that not only cleaned the surface but also reduced the amount of dust, one of the strongest allergens, in the air. William Henry Hoover got interested in Spangler’s invention and bought the rights to produce and sell the appliances based on his technology. Nowadays, Hoover is one of the most popular vacuum cleaner manufacturers all over the world that can offer a great range of vacs of numerous types including backpack vacuum cleaners.